In an era of funding cuts and attacks on news media, five startups geared toward digital disruption in Canada’s news sector had the unique fortune to take home big winnings last week during Ryerson’s Digital News Innovation demo day. On Oct. 5 the companies showcased their products and services at the Digital Media Zone’s (DMZ) Sandbox to a panel of judges, mentors and industry leaders in hopes of winning the final prize of $100,000 in seed capital. In an unexpected turn of events, each startup took home a winning cheque. 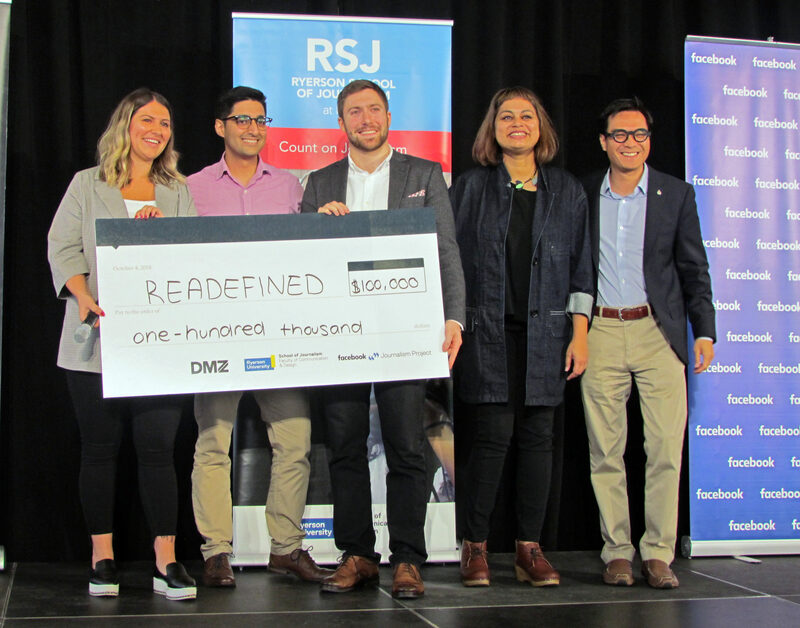 The demo day comes after Ryerson announced a three-way partnership between Facebook, Ryerson’s DMZ and the Ryerson School of Journalism last year. The Digital News Innovation Challenge was created to support digital news ideas and early-stage tech-companies that promote innovation in journalism and news organizations. The startups were selected and had been working on their projects since April. Each startup brings something unique to the media landscape. Created by women, for women, The Gist, is a newsletter that provides female readers with sports-related news and features. Calgary-focused startup, The Sprawl, is a startup trying to tackle the crisis of local news. It is a digital publication that provides local news coverage for residents. In the age of “fake news”, breaking news app The Ground uses social media, traditional news coverage and verified information from citizen journalists to provide readers accurate, timely information. Designed for online publishers, Readefined is an analytics platform that shows if/when readers engage with online content, for how long and why. Utilizing popular Smart Home technology such as Amazon’s Echo, startup Trebble FM is an online platform that lets media and independent creators distribute interactive newscasts. According to the Shattered Mirror Report, roughly one-third of journalism jobs have been lost over the past six years. Access to quality local news is critical to a community’s civic health, the report states. however Kevin Chan, global director and head of public policy for Facebook in Canada, explained the partnership. The idea for the three partners stemmed from trying to find ways where they could each catalyze innovations to the news sector, explained Chan. According to April Lindgren, principal investigator for the Local News Research Project, local news “creates a common narrative for a community.” Lindgren’s current research explores local news poverty, which is the extent to which residents have access to critical information needs from the local media. Jeremy Klaszuz, of The Sprawl, saw the importance of creating a platform that focuses on solutions journalism to support local news in his community. “I think people want to feel connected to their community, and local news can do that, and when it’s not there they feel less connected,” said Klaszuz. In Calgary, Klaszuz explains being able to tell in-depth stories helps connect people to issues in their city and helps empowers them. “There has never been a more important time for innovation in journalism, to experiment with technologies and economic models,” said Janice Neil, chair of the Ryerson School of Journalism at FCAD in a press release.